You are currently browsing the Carpe DMM blog archives for March, 2017. We woke early yet again, around 05:00, and dozed a bit before getting up so M. could shower before breakfast. We went to the breakfast buffet in the Albergo Firenze, which was similar to most of the others so far. This time thought there was bran cereal, which we both mixed with some muesli. M. had two cornetti, one with jam and one a sort of wholemeal one. I tried a bit of some paper thin looking bacon with scrambled egg, on a slice of fresh bread, and then a small slice of a tart which was covered with apricot jam and various nuts. 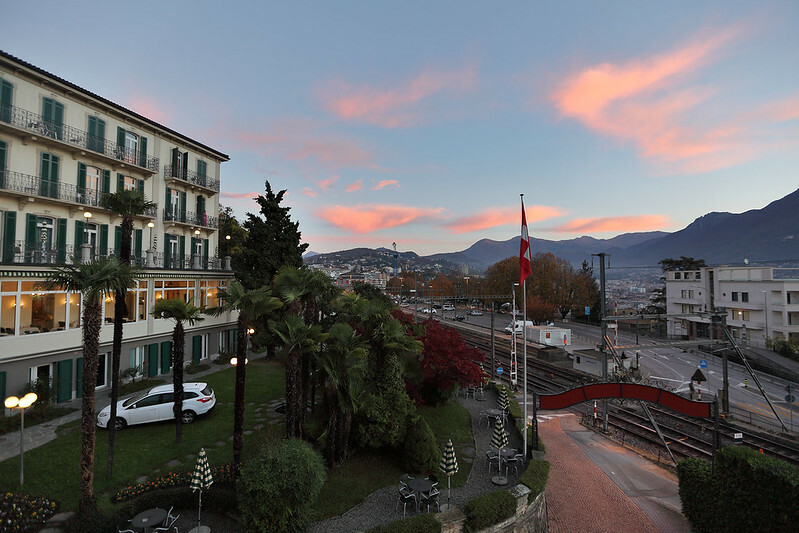 We took our time, then returned briefly to our room before heading out to explore Como a bit. We woke up too early again, this time around 05:00. M. fell asleep again, but I didn’t. We were up and showered and ready to go to breakfast shortly after 07:00. The breakfast buffet at the hotel was pretty extensive, with several cereals and types of yoghurt, different breads and croissants with three different fillings – chocolate, apricot jam, and custard – as well as plain ones. In the hot food warmers, as well as scrambled and boiled eggs, bacon, and sausages, there were also chicken skewers, Thai money bags, spring rolls, and small triangular samosas. M. took a croissant which she thought had jam in it, but it turned out to be chocolate, so she went back for a jam one as well. I was amazed to find, amongst various doughnuts and cakes, a row of vanilla slices! So I had to take one to review for my vanilla slice blog. We lingered over breakfast, allowing me some more diary writing time. After eating our fill, and telling each other how full we were, I went to use the nearby toilet, and when I went to undo my belt, the buckle popped right off and fell on the floor! The leather bits holding the buckle on had snapped! When I returned to the table I tried to tell M. what had happened, but couldn’t stop laughing for several minutes. About 09:30 we went back to our room to pack and check out. We dropped our luggage in the car and checked out, but before driving off we walked once more down the hill to the old town, this time to look around during the day, when most of the shops would be open. 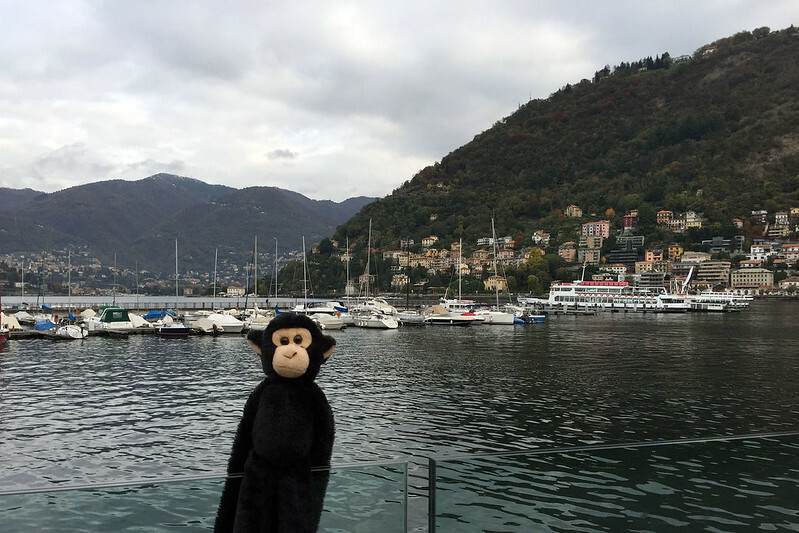 As well as browsing various things in the narrow streets of the old city, we crossed to the waterfront to look at the lake and the view across to the nearby mountains. We also popped into a department store to buy a new belt for me, which took some time as we found a few small displays of belts, none of which were particularly appealing to me, and only when M. asked an assistant did we get shown a huge display of belts on another part of the floor. I picked a brown leather one and we paid and continued wandering around. We woke up early again, still not into the rhythm of sleeping through to sunrise. We showered as the sun came with wispy pink clouds over the valley. We went down for breakfast in the hotel at 07:00. Again, nearly everyone there seemed to be Chinese tourists, until later an Indian couple came in. We had muesli and fruit and things. The croissants here were nowhere near as good as in France or the French parts of Switzerland. Back in our room, I took some photos of the sunrise and noticed that the building opposite our room was a dentist’s office, as I could see the dentist working on a lady reclining in a chair through the window. Checking the weather forecast for the Alpine areas I saw that snow was on the way later in the week, and today’s forecast was for rain, but tomorrow’s was colder, but sunnier. I didn’t want to drive through the Furka Pass in the rain, or risk getting snow and having the road closed, so considered staying for a day in the Interlaken area to avoid the rainy weather. But then I looked at a more detailed hourly forecast, and it said today was going to be partly sunny, with rain developing late in the evening. This seemed okay, so we decided to leave and spend the day crossing the Alps. 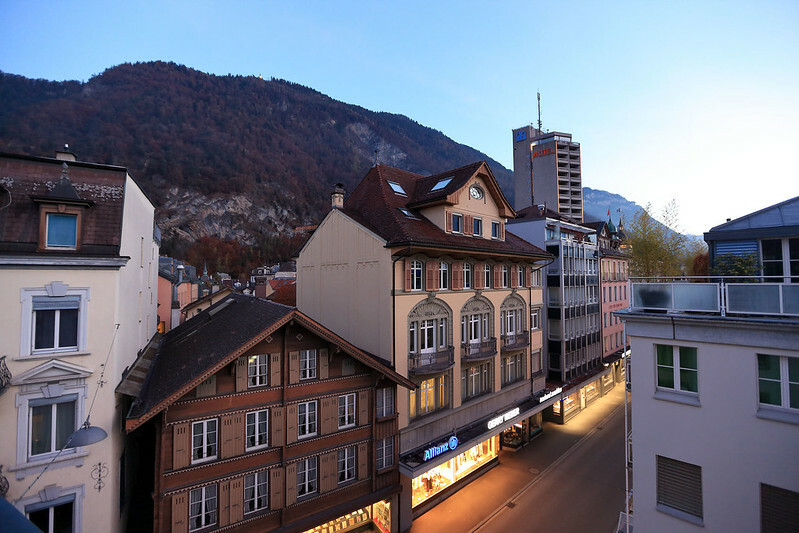 As it was a full day of driving, and nothing seemed to open in Interlaken until 10:00, we checked out, packed the car, and drove off early rather than wait and delay our departure. The sky was promisingly blue, with just a few puffy white clouds to add interest, and it remained this way all day, so our gamble on the weather paid off well. I got up this morning and had a shower before heading out to meet Stuart in the hotel lobby. 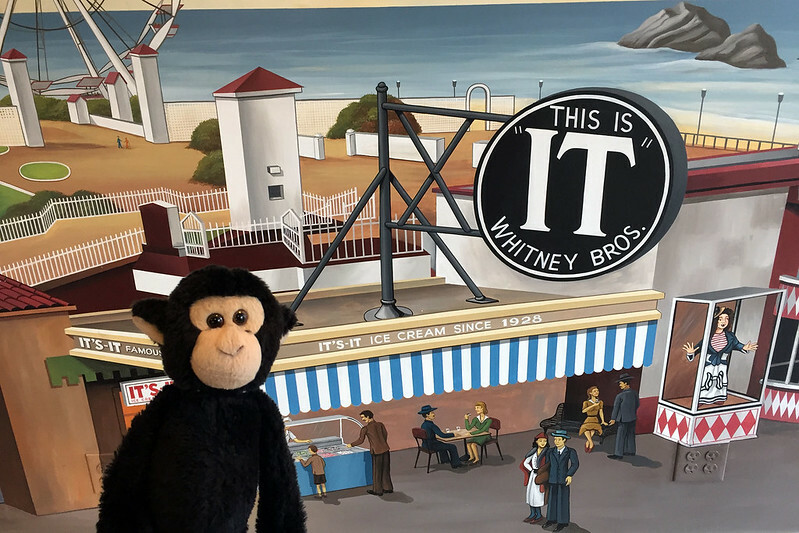 We walked to Millbrae station, stopping at the It’s-It ice cream factory to try to get an ice cream sandwich for a pseudo breakfast. Unfortunately they didn’t open until 10:00, so we couldn’t, which meant I had no real breakfast at all, my bagels having run out yesterday. We got to Millbrae about 09:30 and then into the city a bit after 10:00, getting off at Embarcadero. 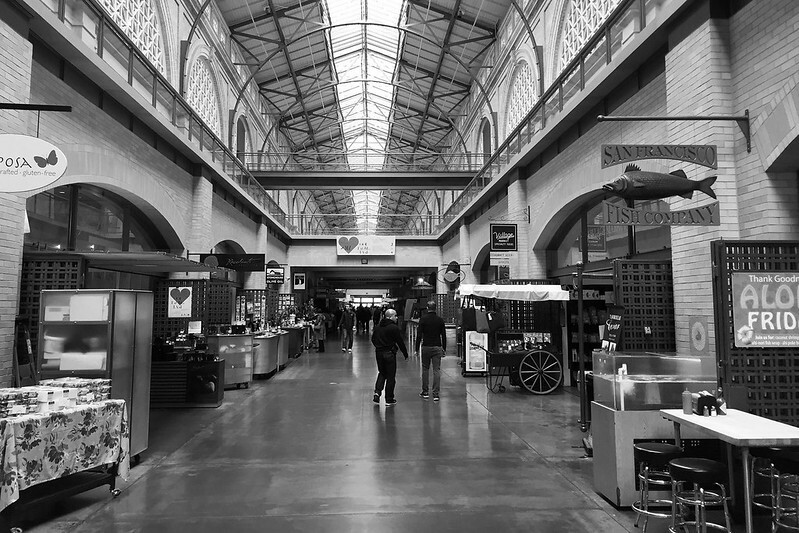 From there we walked across into the Ferry Building to look around a bit. I said we could at least get some ice cream here, from Humphry Slocombe. But when we arrived at the store it didn’t look open, and a woman was setting things up. I asked when it opened and she said 11:00! Not having had breakfast, I was getting hungry now, so I bought a currant bun from a bakery, which was nice, to hold me over until lunch. We walked north along the Embarcadero, having planned our morning to arrive at Golden Boy Pizza at 12:30, the time and place designated by Scott for meeting up to have lunch together. We stopped in at the Exploratorium gift shop, but didn’t have time to justify paying the admission fee to the museum proper. Stuart said he wanted to buy some San Francisco souvenirs for his kids, and I suggested some of the things here might be good, but they weren’t really tourist souvenirs, as in labelled as from San Francisco. I saw a cool looking science tarot deck, which was a tarot deck reimagined with scientific imagery. It was attractive, but cost $30, which was too much to justify. I slept better last night, and was woken too early by the alarm at 08:00. I ate my last bagel with the last of the cream cheese, after having a shower and getting dressed. Then I went down to buy some more fruit, only to find that the pop-up snack shop wasn’t there. I ran into Jackson, who suggested the small shop attached to the bar and restaurant. I went up there and they indeed had fruit, so I grabbed two apples and a banana again. I asked how much the fruit was, and the lady said a dollar, but this time when I went to pay the total was $3.26. For some reason they were adding sales tax here when they didn’t do so at the pop-up version down in the lobby. The last day of conference talks was interesting, though it began a little inauspiciously. I chose a talk whose title promised a history of virtual reality from primitive beginnings to a bright future. It turned out to be all about CAVE immersive display rooms, and nothing at all about head mounted VR displays. It was interesting, but completely not what I was expecting. But then came the Human Vision sessions about art and aesthetics, which I always enjoy attending because they are so different and they intersect the realms of science and art, which are both fascinating. There was a session either side of lunch, and they contained some very cool talks. The most interesting was one in which a woman told us about her research teaching blind people to draw, by letting them feel a tactile raised line drawing, and then trying to draw a copy from memory. After some brief training they got pretty good at this, and then tests of other spatial, coordination, and navigation abilities also showed significant improvement, even six months after the drawing training. So she’s advocating giving this sort of training to all blind people to improve their spatial awareness and navigation skills. At lunch I basically repeated what I did yesterday, taking a walk along the bay shore while eating an apple and a banana, and then returning to the hotel via the It’s-It ice cream factory. This time I didn’t take my SLR camera, but I took my umbrella, because it was threatening rain, and in fact had been raining earlier in the morning. I also took Monkey, to get some photos with him. And instead of mint, I chose a chocolate ice cream sandwich, which was also good. In April 2016 I ran my first Kickstarter, for a print collection of Irregular Webcomic! Fantasy comics. This Kickstarter funded successfully, and several hundred backers had their copies of the book delivered in time for Christmas last year! I also had a few extra copies printed, and you can buy them right now from TopatoCo, here. Here is a post-mortem analysis of the financials of running this Kickstarter campaign, for general edification and posterity. All amounts are in Australian dollars (AUD) unless indicated (converted from US dollars at the exchange rate on the date of transaction, if applicable). First, the good news! Here’s how much income I made from the Kickstarter! Wowee! Now some mildly bad news: Here are the expenses I incurred in putting the book together, advertising the Kickstarter, mailing out original artwork as rewards for higher tier backers, and other miscellaneous things. It was conference routine again today, getting up, eating a bagel for breakfast, and then heading down to a day of talks. I bought a couple of apples and a banana from the pop-up snack bar which was there to cater to conference attendees. They cost $1 a piece. The morning talks were the last of the Digital Photography conference. There was a talk about infrared camera calibration and another about measuring MTF of sensors, so they were interesting. After the coffee break was a keynote about CMOS sensor design, which wasn’t so exciting for me. At lunch I went for a walk to get some exercise, across the road to the bay shore and then north along the path that runs there. I ate the remaining apple after having one earlier for morning tea, and the banana. I took my camera with me to get some photos of the birds that putter around on the shore of the bay. I didn’t have a long zoom, but got some moderate shots of a few different birds, including a big white egret, some ducks, and some wading birds. 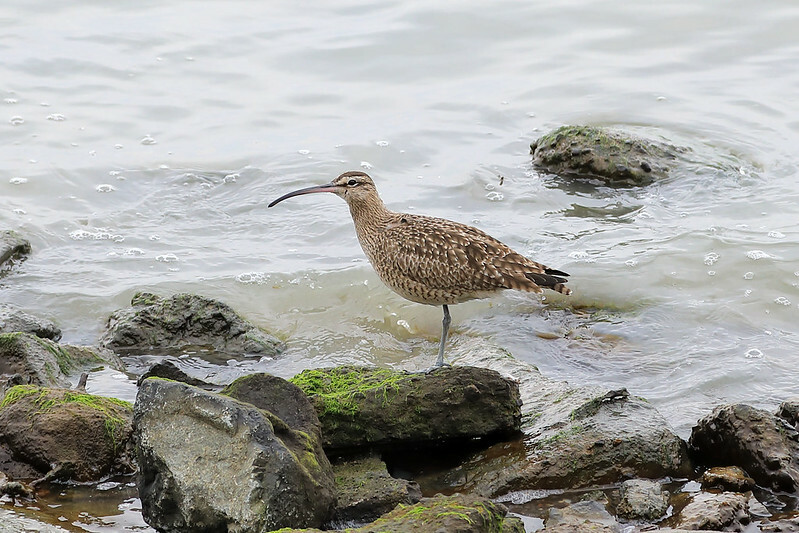 I later identified the birds as: willet, long-billed curlew, snowy egret, American crow, grey plover, and canvasback ducks. I slept better during the night than so far on the trip, but this made me slightly groggy when I woke up in the morning. I dragged myself into the shower and then packed my luggage so I could check out of the hotel. I went down about 08:00 so I had plenty of time and checked out, then left my main bag at the luggage counter, and then booked an airport shuttle to Haneda for the evening after determining that it only cost 720 yen, almost the same as the train fare and a lot simpler. The shuttle I selected left at 18:17, getting to the airport around 19:00 for my 22:00 flight. The shuttle bus also took payment by Suica card, so I made a note to charge my card enough to cover the fare. Then I went to the meeting rooms to check emails and stuff before the final sessions of the ISO meeting. These sessions went fairly quickly and smoothly, being mostly the final summaries of the ad hoc group discussions and then going through the action items and resolutions, before saying farewells and looking forward to the next meeting in San Jose in June. With the meeting closed by lunch, I had the afternoon free. First order of business was lunch, and this time we formed a group of six for sushi: me, Margaret, Jonathan, Dietmar, Ari, and Neelam. 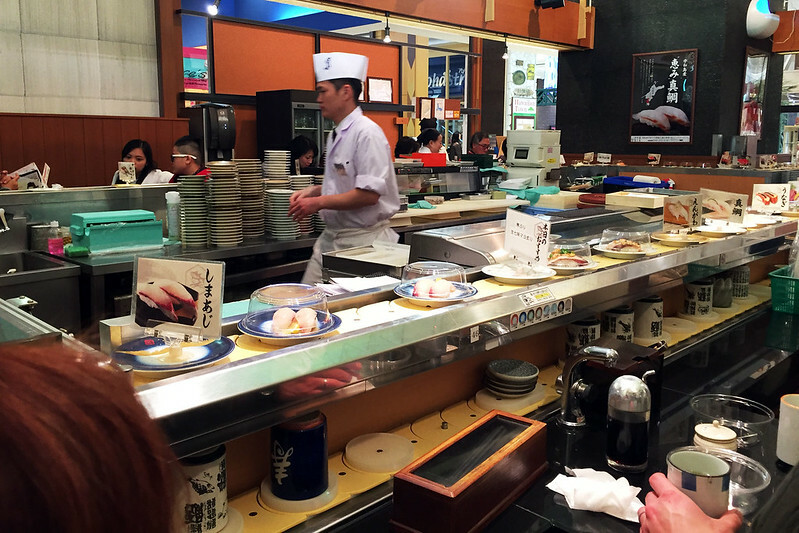 Instead of the one at MARK IS, we went to the other sushi train place at World Porters. The menus and pricing were identical, which made us think it might have been some sort of chain, but when we finished the waitress wrote down our bills on paper rather than scanning the RF chips inside the plates, so maybe it was different but similar. This morning was the “big break” from the ISO meetings, meaning we had the morning free to visit the CP+ camera show, being held in the Pacifico Yokohama convention centre adjacent to the hotel. Our instructions were to be in the meeting room at 09:00 to receive registration forms for the show and then be taken over so we could register as press members so we could get in to the “press time” from 10:00 to 12:00, which is restricted to press so they can see the show before the public crowds are admitted. But first I woke up, a bit after 07:00 again, had a shower, and then went out to get some breakfast from the nearest convenience store, which is over in Pacifico Yokohama. It was about 08:30 when I went there, and the shop was busy with a dozen or more people constantly moving through buying snacks and breakfast or whatever. This time I stuck to the tried and true sushi rice snacks, which delivered a much better experience than the ham wraps from yesterday. Then I went to the meeting room to get my CP+ registration. 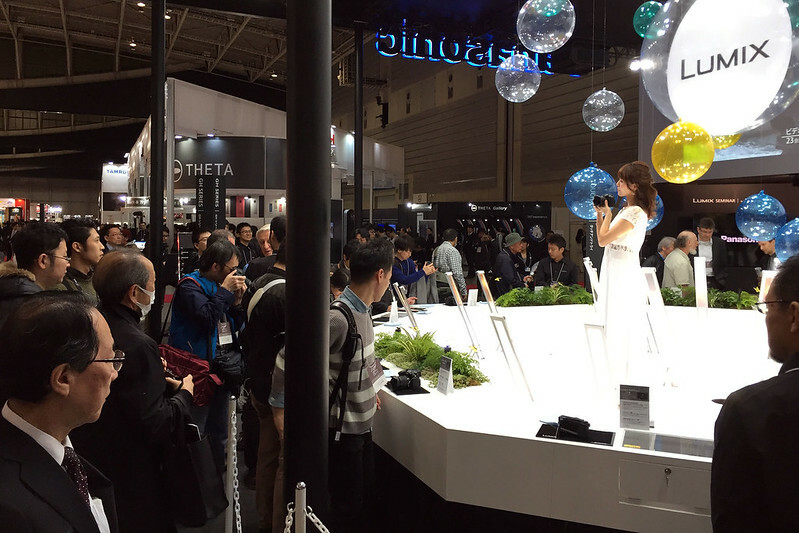 Most of the Japanese attendees weren’t there, presumably being not that interested in attending the show. But most of the visitors were also absent, and only showed up fairly late, perhaps thinking they didn’t really need to be there as early as 09:00. Sasaki-san gave us forms to fill in indicating our ages and what industry we worked in. Then at 09:30, Yamamoto-san led us over to the registration desks at the show and herded us into the right area to wait for the entry time. Dozens of staff kept people in order, making sure nobody went anywhere they shouldn’t be and checking everyone’s passes. Eventually, at 10:00 on the dot we were allowed into the exhibition hall. This giant space was filled with booths from dozens of manufacturers of cameras, lenses, binoculars, telescopes, microscopes, and accessories such as tripods, filters, bags, and so on, as well was printers and paper. Having got the general impression last year, I concentrated mainly on visiting stalls with large photographic prints on display, to look at the photography. Many of the stalls had these, showing off either the cameras, the printers, or the paper, depending on what they manufactured. Canon also had some 8k HDR displays, which were stunning to look at.